It was the 7th period of the day. Everything went on as usual. Shouting in the class, throwing of the chalks and cat fights. I was in Class IX, and had just returned from Delhi, after having successfully won the CBSE National Level Science Exhibition. What a happy month that was for me! Everything seemed so fine. All of a sudden there was a boom, the window panes shook. Ignored!! We continued with our work. However, soon we realized something was wrong. The bell for the 7th class rang 20 minutes back and still there was no teacher in the class, and we are absolutely sure about the presence of our teacher in the school premises. Being the best friend of the class monitor, I stepped out of the class. All I could see was teachers assembling in groups and discussing something serious. First thought, someone might have pulled another serious prank in the school. All of a sudden, our Biology ma’am started coming towards me with a serious look. Second thought, what did I do?? She came to me, took me to a corner and informed me of a very horrific incident. 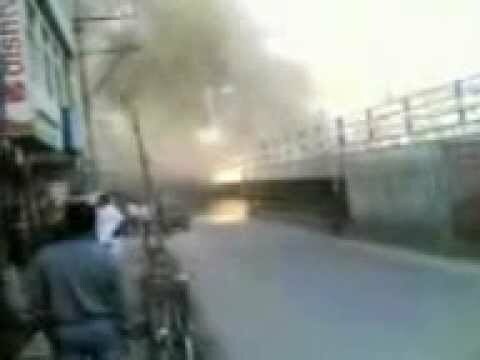 There has been serial blasts in Guwahati. The latest one being just a few meters away from the school, at Ganeshguri, one has been confirmed in Pan Bazar, while there have been rumors about some other places. Heavy causalities expected. She asked me to keep clam, and asked me to inform the class about the whole of incident and ask them not to make a hassle and not to move out of the school premises as the largest causality site is just next to the school. I panicked, my dad was out of town, my younger sister was in Class IV, and mom was about to come to school to pick her up. And since it was barely before the school ended, and mom makes her way through Ganeshguri, I seriously panicked. Ma’am was kind enough to give her cell phone, I called up my mom, ascertained her safety, convinced her about ours and went back to the class and informed the class about whole of the scene. What a day it turned out to be. There was chaos all around. Within minutes cell phone networks jammed, which further added to the panic of the people. According to reports, around a lakh phone calls made is way within 10 minutes which jammed the network. All we could see form the closed gates of the school campus was black smoke. Hundreds of students waited at the school ground accompanied by numerous parents and strangers, who took shelter due to safety reason. Some other school children too joined in. I received my sister from class and was waiting with my friends. All of a sudden mom came in out of nowhere. She could not resist and came running with a neighbor of ours, whose son was my classmate. We all waited. Did not know what was happening outside. Where else there has been a blast? What would happen next? How safe we were? 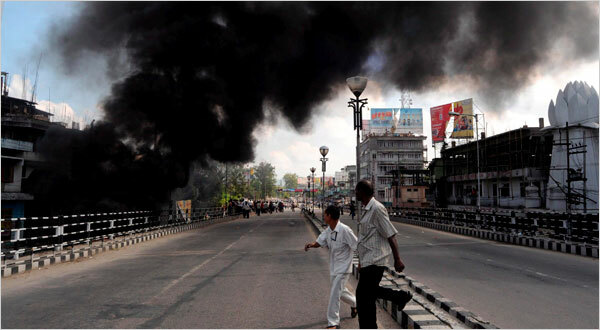 All we were staring was at the black smoke amidst the blue sky. We waited. Waited for 4 hours, at 4:30 pm, my mom decided. We should head home. It was getting dark and there might be some more trouble. Home is the best place to be. So accompanied by my sister and mom and some other nearby students I stepped out onto the public deserted road. All around we could see was Khaki dwellers. Deserted roads and blockades all around. The black smoke still continued to rise. An ambulance passed by, with its doors open, caring a semi charred body. I fell sick. What has happened? Why? We reached home, the news was all flooded. My dad called, he was safe and was relieved to find us back home unhurt. Those visuals, on TV, horrifying. The night was sleepless. How could you sleep? No one could. But the real shock came early next morning; it was a friend of mine, we were to be at the place of another friend of ours, whose birthday it was. Of course, the plan was cancelled. But the news was, he lost both of his parents at the bomb blast. Only the ashes of his dad alongside the rings could be found. So many people lost their lives, so many were left injured and so many more traumatized. Violence would do no good to the mankind. Let all the souls rest in peace; and peace prevail on earth.